This first-of-its-kind educational kit provides 5th–12th graders everything they need to learn how tracking physical activity and fitness improves overall health. 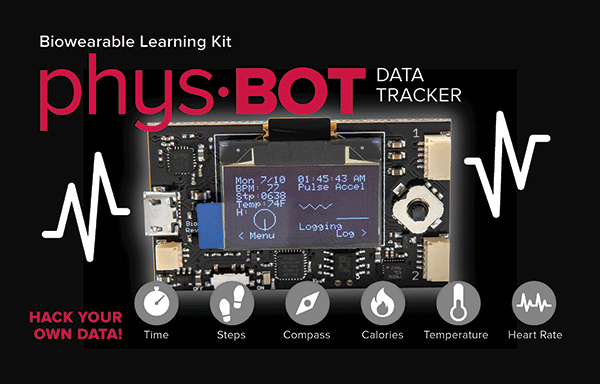 The PhysBot kit, which assembles in minutes, includes a data tracking device, wristband, external heart rate monitor, 9V battery connector (battery not included), and instructions. Plus, a curriculum guide, proprietary software, and web support are available via links below. The PhysBot device is equipped with an Arduino microcontroller that connects heart rate, steps traveled, and temperature to the tracker’s circuitry. Users monitor sensor activity with the tracker’s exclusive LED display, providing an enhanced data tracking experience. Data transmitted from the sensors to the Arduino processor is stored, processed, and transmitted to a Mac or Windows computer via a detachable 2-meter USB cable. Exposed circuitry is designed to demystify the components that make up a fitness tracker. Compass uses a magnetometer built into a 9-axis sensor to determine the direction of magnetic north. Step counter uses an accelerometer built into a 9-axis sensor to count steps. Heart rate monitor measures differences in reflected light through the skin as pulse. Temperature sensor is part of the device's 9-axis sensor. Calendar/date/time is in real time as long as power remains connected using a special frequency crystal (32.768kHz). Data logging stores up to 1MB of data to flash memory, which is about 8 hours of data with a logging interval of 1 second. Proprietary software is designed for Windows and Mac systems and allows users to track data. Always clear the data log on your device before collecting fresh data. Always turn off the data logging function on your PhysBot device before syncing. Always start on the PhysBot software homepage before syncing your device. If your device becomes damaged or inoperable, return it to Tiny Circuits for repairs to 540 S. Main St. #457, Akron, OH 44311. Extend your PhysBot experience by adding a lightweight lithium battery from Tiny Circuits at tinycircuits.com/collections/all. This thin compact battery easily Velcro’s to the outside of your band. Plus, it’s rechargeable. Please note all sales are final. No returns or exchanges unless your order is incorrect, incomplete, or damaged upon arrival.